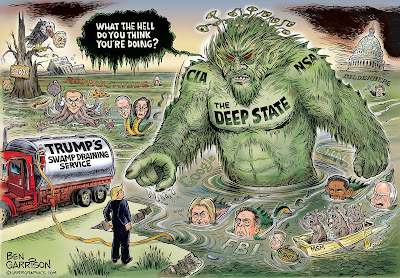 Rogue Cartoonist: Drain the Deep State Swamp! Drain the Deep State Swamp! During last year’s presidential campaign I drew a ‘drain the swamp’ cartoon featuring Donald Trump pulling a big plug. Various characters were swirling down a swampy drain. It was a very popular cartoon and we sold quite a few signed prints. Now that Trump has been elected, I realize that the swamp is much vaster and deeper than the one I had earlier depicted. The ‘Deep State,’ or shadow government, features agencies that have been allowed to accrue way too much power and scope under little oversight. In other words, we allowed a monster to be created. What is the Deep State? It consists of the illuminati who control vast fortunes. It includes the central bankers, the Bilderbergs, the CFR, and the spy agencies that illegally track and record Americans. They want power and control through collectivism. It’s the beast that wants bring about the New World Order. It’s the creature that Eisenhower tried to warn us about. It’s the entity that took out Kennedy when he tried to stop them. Since then, we’ve had too many presidents who were elected under the tacit approval of the Deep State. The possible exception was Ronald Reagan, and he wasn’t the same after he was shot by Hinckley. Aside from the bumbling Carter and Ford, what we mostly got since Kennedy were corrupt Deep State criminals posing as presidents. LBJ was a murderer who sent over 50,000 US soldiers to their death in an invented war in Vietnam. The Bushes cast us into middle eastern sand traps. The Deep State grew ever-stronger and raked in our tax dollars. Sometimes they steal it outright. (Remember the $6.5 trillion missing from the Pentagon?) We got the Bush and Clinton dynasties. Daddy Bush was a former CIA man who helped further the New World Order and the Deep State. Obama gave the Deep State even more power and its shadow grew longer. Then Trump arrived and the Deep State did their best to thwart him. Trump is a populist and a nationalist. He doesn’t want open borders. He defeated Hillary, the Deep State’s choice. Trump is an anathema to the globalist Deep State and they are still trying to take him down. Therefore, they concocted a ludicrous narrative that Russia aided Trump and ‘hacked the election.’ Instead of locking up Hillary, they invented grandiose lies and reverse McCarthyism. They are out to impeach Trump. This could lead to civil war. Snowden told us the Deep State was real and now there’s no doubt whatsoever. Even McCain complained President Trump was a threat to their New World Order. It’s not the stuff of tinfoil conspiracy—it’s real and it’s a threat to our Republic. Trump may be our last, best chance to drain the Deep State swamp. My New Book: It's A Winner!